Lindy BNX-100 review | What Hi-Fi? A few years ago, Lindy showed that it was possible to design a five-star pair of wireless noise-cancelling headphones for under £100. But, as it says in the small print, past performance is no guarantee of future results, and so these BNX-100s arrive with the German manufacturer’s reputation at stake. You can trust Lindy to offer all the mod cons at a reasonable price. For £120, the BNX-100s come equipped with active noise cancelling, aptX Bluetooth 5.0 connectivity up to 10m, a 12-hour battery life (with Bluetooth and noise-cancelling both switched on), an integrated mic and even an auto-pause function that starts and stops your music depending on whether they’re on or off your head. And having the BNX-100s on your head is a nice feeling. They weigh just over 500g, enough to feel substantial without giving your neck muscles a workout. The padded earcups, which house 40mm neodymium drivers, warm our ears to a degree, but are generally rather comfortable. Lindy has made the BNX-100s simple to use, too. A long press of the textured button on the right earcup starts pairing mode – a voice lets you know when it’s complete - while noise-cancellation is controlled via the buttons on the left. 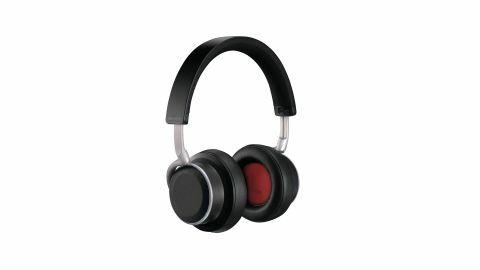 You can also use the multi-function button on the right earcup, and those straddling it, to control playback, volume and calls without reaching for your phone. That’s not exactly a USP, but it is another box ticked. Lindy has generally been good at ticking boxes with the BNX-100s, especially with the price, so we can imagine a few people will be putting them in their basket on this alone. But the Lindy BNX-100s' sound may well make them think again. It certainly isn’t irritating, too jagged or incompetent in any regard to make listening a chore, there’s just nothing about it we could call great. The first thing you’ll notice is the balance, which, much like noticing your internal organs, is a worry in itself. It’s skewed heavily towards a soft bass end, spotlighting perhaps the BNX-100s’ greatest flaw, and rolls off a sizeable portion of top end frequencies. There is a slight coarseness to treble frequencies, but these headphones’ presentation at least means you won’t hear much of that. Turning on ANC tidies things up a little – and, though itself noisy (an almost hiss-like sound isn't uncommon with budget implementations of noise-cancelling), it also cuts out a fair bit of background interference. It helps a little with definition, though any dense arrangement leaves instruments fighting to take up the same space. That paves the way for an overall rather slovenly performance, not helped by a dearth of attack and general dynamic indifference. Timing in itself isn’t too bad but any sense of impetus is lost as the BNX-100s appear content to sit down and let the music pass them by. Finding a truly outstanding pair of wireless noise-cancellers at this price can be a struggle, but anyone shopping for headphones with these specs should also consider Sony’s WH-CH700Ns. They present a far better balance, with greater clarity and a more cohesive overall performance, and they are also (at the time of writing) £20 cheaper. We wanted to be able to say Lindy had improved on its five-star budget wireless cans of a couple years back, and we’re disappointed that we can’t. These are no more than an average pair of headphones and, given our high hopes, that's a shame.